WNBK shared space with co-owned WTAM AM 1100 and FM 105.7 at 815 Superior Avenue in Cleveland. 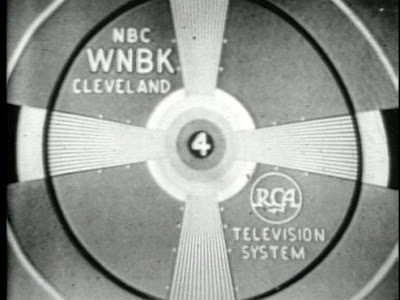 Channel 4's first program was the Philco Televison Playhouse from NBC at 9PM Oct. 31, 1948..As with most early TV stations, WNBK's sign on was in the early afternoon, eventually at 1PM weekdays..Most of the afternoon programming was local..with network programming, of course, in prime time..By January 14, 1952, when NBC's "Today" premiered, WNBK came on the air at 7AM..
8:30 This Is Your World-Edward Wallace-Possibly the first local Newscaster on WNBK-Guests Professors Henry Miller Bush and John Culver of Cleveland College discussing "Russia"
Next:More of "50 Golden Years"..Tom Haley looks back to the early 1950's..and more..
That test pattern layout was also used by what was then WNBT (Ch. 4) in New York and WNBQ (Ch. 5) in Chicago. Presumably also by what signed on in 1949 as KNBH (Ch. 4) in Hollywood, though I've not seen any vintage test patterns from that station.